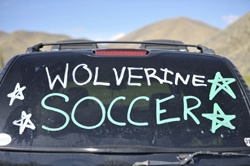 Samantha Sutton’s penalty kick put the Wood River High School girls’ varsity soccer team back in the driver’s seat of the Great Basin Conference tournament on Thursday at SunWay Soccer Complex in Twin Falls. Sutton, one of nine Wood River seniors, scored from the penalty spot in the 65th minute after a foul on top scorer Jesse Cole and the No. 3-seeded Wol-verines went on to beat three-time defending GBC tourna-ment champion Twin Falls by a score of 1-0 in the title game of the 2014 GBC tourney. Wood River’s fourth con-secutive shutout capped an un-beaten 3-0 tournament record and lifted the Wolverines to the 10th district tournament championship in school history and their first since 2010. Wood River with its ninth shutout in 17 games captured the rubber game of the three-game series between the two rivals. The teams split in the regular season, Wood River winning 3-2 in Hailey Sept. 9, and the Bruins prevailing 3-1 Sept. 25 in Twin Falls. The outcome avenged Wood River’s 4-0 drubbing by Twin Falls in the State 4A tourney consolation game last October. Thursday’s conference championship game was a thriller as the Wood River de-fense stepped up, blanking the Bruins for the first time this season. High-scoring Twin Falls had scored 96 goals in 17 previous contests. Stouffer said, “It was a great game on both sides of the ball. Twin Falls really does bring out the best in us when we play against them. “The Wood River girls rose to the occasion by never giving up the whole game. I felt our defense was holding down the potent Twin Falls offense and the midfielders were helping defensively and offensively. “The biggest thing is the team displayed great patience until we had a chance to score. “Jesse Cole threatened to score in the 65th and was taken down in the penalty area awarding the defender a yellow card and a PK for WR. Sutton’s seventh goal of the season and 34th of her Wood River career sent Wood River to state, where six teams will be returning from last year’s state meet in Caldwell. Both Wood River (13-4-0) and top-seeded Twin Falls (14-4-0) had already qualified for the State 4A tournament Oct. 23-25 in Coeur d’Alene and Lake City—Stouffer’s squad having earned the Hailey school’s 20th straight state trip with an upset 3-0 win over Canyon Ridge’s Riverhawks.  Sandpoint (6-8-2) vs. Twin Falls (14-4-0) at 9 a.m. at Lake City High; and Century of Pocatello (14-0-1, 67-7 goals against) vs. Middleton (12-6-0) at 11:30 a.m. at Lake City. Cen-tury brings seven straight shutouts into state. On the other side of the bracket: Wood River (13-4-0) vs. Preston (13-5-0) at 11:30 a.m. at Coeur d’Alene High, and Bishop Kelly (13-3-0) vs. Kuna (10-10-1) at 2 p.m. at Lake City. Preston, having beaten Pocatello three times in three tries by scores of 7-3, 4-0 and 5-0 this season, earned its state berth 1-0 (OT) over Pocatello, at Preston in Saturday’s play-in game. Chloe Hendrickson’s 36th goal of the season lifted Preston. Kuna beat Great Basin third-place Canyon Ridge (11-8-1) by a 1-0 score at Mountain Home in Saturday’s other play-in. Last year, Sandpoint (13-3-4) snapped the 89-game unbeaten streak of the Bishop Kelly Knights with a 1-0 win in the State 4A championship game at Middleton. It was Sandpoint’s sixth State 4A girls’ soccer title, but first since 2009. Century-Middleton is a re-match of last year’s State 4A third-place game won by Cen-tury 1-0. The Diamondbacks have won three state champi-onships, in 2003 and 2005-06. Of the eight teams due to compete at Coeur d’Alene, only Sandpoint, Century and Bishop Kelly have won 4A titles since the Idaho High School Activi-ties Association started sanc-tioning state tournaments in high school girls’ soccer in 2000.